Clue Suspects is a new game from Winning Moves that offers something quite unique: a single-player Clue game. Clue Suspects was invented by Australian Dugald Keith, and was originally published in Belgium, where it proved so popular that it was imported to the United States as a Winning Moves title. This is the first ever Clue game that can be enjoyed by just one player. Clue Suspects is a logic puzzle, with each of the 60 puzzles in the game becoming progressively more challenging. More and more, people love puzzles and brain teasers. In Clue Suspects, your challenge is to figure out “whodunit”. Find the suspect who was at the scene and you’ve found the murderer!. You’ll keep track of clues and test your deductions without pencil and paper. All of the Clue Suspects contents pack inside the plastic mansion making this a great travel game. 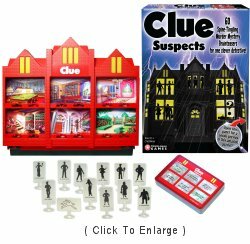 Clue Suspects comes with a plastic mansion board, and includes 12 plastic suspect pieces (including several new characters), and 60 mind-boggling mysteries to be solved. 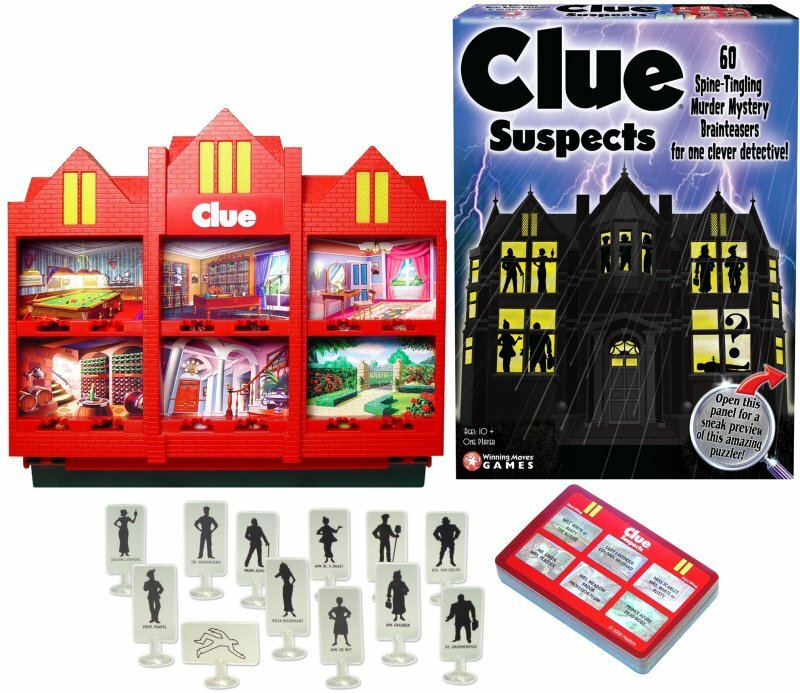 The game includes all the familiar Clue characters (Colonel Mustard, Miss Scarlett, Professor Plum, Mr. Green, Mrs. White, and Mrs. Peacock), plus five new characters (Mrs. Meadow-Brook, Prince Azure, Rusty, Lady Lavender, and The Butler) as well as the Dead Body, of course. Learn more about Clue Suspects.